“Far Beyond the Stars” is a masterpiece on so many levels and an episode where the trials and struggles of the 1960’s reveal themselves to sadly be just as true today. We are so far from the world of “Deep Space Nine” in not just our television but our science fiction books too, even if things have improved in some ways. This is an episode that has such a powerful point with some of the best writing and acting to come out of this series. The fact that Avery Brooks (Captain Sisko) was also the director also lends more power to it when you look how focused on justice so much of Avery Brooks’s passion has gone towards post “Star Trek: Deep Space Nine.” On a final note before I get into the details, it is also a very meta and philosophical episode of Trek. “Far Beyond the Stars” was as stated above, directed by Avery Brooks with the teleplay by Ira Steven Behr and Hans Beimler with story by Marc Scott Zicree. The story begins with Captain Sisko’s Father Joseph Sisko visiting the station as Ben is rethinking what difference he is actually making, as his friend died in a routine patrol of the Cardassian Border and the Dominion War looks as if it has no sign of ending. His father tells him he should think on it as he begins seeing people from the 1960’s before he is transported into the world of Benny, an African American Science Fiction Writer during the 1960’s where his story unfolds and realities keep colliding as they try to find out what’s going on “Deep Space Nine” as he faces the reality of the past in the life of Benny. The Pros: Benny’s World – I love that they set in the 60’s and unlike the “Mad Men” version of the 60’s we get to see the lives of the middle class, the poor and people who aren’t of European descent. The world doesn’t pull any punches with every character being flawed and discrimination being widespread and enforced by the law. I’ll get into more of the details when I explore the characters though. The Soundtrack – There is so much great jazz in this episode and so often the episode knows when to be silent, it isn’t standard recycled music and that really made the episode just that much stronger in the presentation and story. The Characters – I’m only referring to the characters of Benny’s world in this instance since the only people really explored in Captain Sisko’s time are himself and his father. The characters of Benny’s world (played by the same actors who make salutes to their counterparts in personality and actions) are wonderful. They are distinct while still having the inspiration of “Deep Space Nine” (or vise versa as I’ll go into later). Willie Hawkins – Michael Dorn plays the baseball player who shows us that it doesn’t matter if you are star athlete, housing ordinances are still just that and even though some whites want to see you play they don’t want you around (most housing ordinances weren’t ended until the 90’s and 80’s even). His way of dealing with it is flirting with everyone. His character is very confident and it’s fun to see. He knows he’s a star and Dorn does it very well. Jimmy – Jimmy is a young African-american guy and friends with Benny and a bit of a hustler. The day he gets the opportunity for wealth the detectives Burt and Kevin murder him. They say it was for breaking into a car but based of their reaction of beating up Benny for even asking questions I sincerely doubt that. R.I.P. Jimmy. Sad thing is this still happens today. This scene is given more power given the actor plays Jake Sisko…Benjamin Sisko’s son in the series as a whole. Cassie – Played by the actress who plays Captain Sisko’s wife Kasidy she is great in this as the woman who accepts discrimination (and Willie’s creeping) and wants to build a life that she feels is practical with Benny. To this end she’s working at owning the restaurant she works at and trying to get Benny to see it too. She’s super supportive of him and his writing though and takes care of him after the cops beat him up. Kay Eaton – Kay is played by Nana Visitor who plays Major Kira and she is an author who writes under a name K.C. so people will think she is man. She is aware of the prejudice and inequality around her and can relate to Benny in that way. She’s more resigned than Benny though and doesn’t fight Pabst over the injustice of the Editors. Herbert Rossoff – Rosoff played by Shimerman (who plays Quark) is the one person always clashing with Pabst (played by Rene who plays Odo) and is most vocal against the injustice of Benny’s story not being published and the editors shutting down the magazine for a month because of Benny’s black protagonist. Douglas Pabst – Played by the actor who plays Odo, like Odo Pabst is all about the rules, even if they are unjust. He doesn’t care about injustice he cares about money and fires Benny when the Publishers choose not to run the stories. He isn’t even well intentioned he is all about the rules, just like Odo. He is the status quo and those who do nothing. Benny Russell – Benny Russell is the one dreaming “Deep Space Nine” and the one being dreamed by Captain Sisko. He has victories like when Pabst accepts the story of “Deep Space Nine” being a dream. He is inspired by Delaney a gay African American writer whose story was rejected because his protagonist was mixed race. Benny the character is different in that he is working to be married with Cassie but his role becomes bigger after “The Preacher” reminds him of his role as a a symbol of the future and justice and making the story of “Captain Sisko” real by telling the story. This ends with him being put in a hospital though as he stands up to Pabst and cries out to be recognized as a human being. 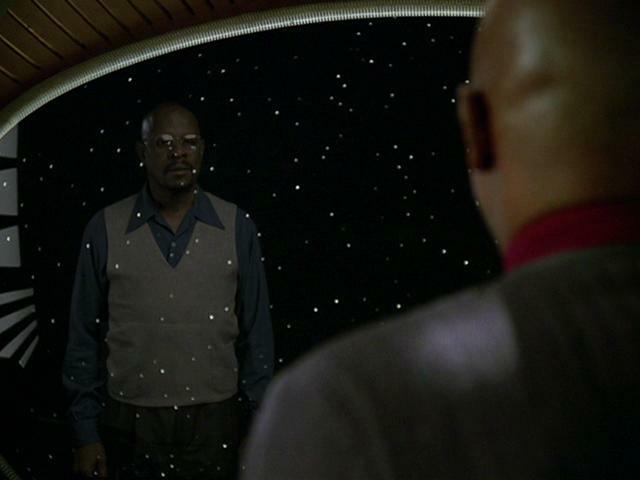 Joseph Sisko – Joseph reminds his son Ben of how important it is to fight, which makes sense that he’d be the Preacher in Ben’s dream of Benny as he is calling Captain Sisko back to the struggle and making sure a just world remains or can come about…that life is bigger than those he has lost and himself. Captain Sisko – Sisko is mourning the loss of his friend but after he dreams of Benny and realizes that Benny could have dreamed one another into reality realizes how important it is to fight and struggle against injustice, be it discrimination or the tyranny of the Dominion. Honorary Mentions – Alamo (Dukat) and Combs (Weyoun) play corrupt detectives who are the ones responsible for killing Jimmy…and Meaney played a bumbling writer who liked robots. They weren’t bad characters but they weren’t explored some of the other characters were, which is why I’m giving them honorary mentions. Easter Eggs – The Magazine they are writing for has “Star Trek: The Original Series” stories in it’s pages. Ranging from “The Cage” to “Where no One has Gone Before.” It’s a really cool salute to the past early science fiction as well as the ripple “Star Trek” created by it’s existence as a show during this time period. The Meta Moments – The whole idea of “Deep Space Nine” all existing in the mind of Benny is very meta as “Deep Space Nine” existed in the writers who wrote the show. Benny is almost a stand in for them and the story they all sought to tell. The Message – There are quite a few messages in this that stands out. The dreams of the present can become the dreams of the future and the dreams of the past remind us of what we still need and can accomplish. There is also the fact that injustice must be fought if anything is ever going to change and the power of story and how ideas can never die. This article shows that Delaney’s story is still true in many ways today and it is certainly true on television and other forms media. Now I don’t know how much talking about it changes it, but sometimes it is the stories that do. Look at the influence “Star Trek” has had on the culture and with that the same potential other science fiction shows can have. What is the future we want to create? The Potential Future – There will always be problems I think, maybe and hopefully not the same ones even if echoes of those same problems remain…but it is in our power to change them, for each generation to make those changes in how they live, the laws they make and how they and we treat our fellow human beings. I don’t know if it will ever happen, but I hope for the future that “Deep Space Nine” represents. Final Score: 10 / 10. One of the greatest stories to ever come out of “Star Trek” and still relevant to this day.